Non-linear means that the relationship between input power (or voltage) and output power does not plot on a graph as a straight line. Don't confuse non-linearity with frequency response (gain versus frequency). In general, passive components are purely linear (loss is constant versus input power), while active components are all nonlinear. Also, it is OK to spell "nonlinear" as "non-linear", in our opinion. This site suggests that adding the hyphen is British English, while omitting it is American English. Here at Microwaves101 we swing both ways! Here's a page we've started on nonlinear transmission lines --and we've added a link to a video of a soliton! Know the difference between small signal response and large signal response. Small-signal implies that the RF signal is low enough so that the device behaves linearly, i.e. 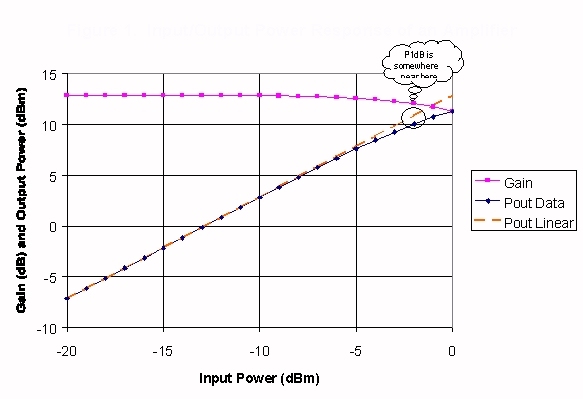 a one dB increase in input power results in a one dB increase in output power. Large-signal means that you have enough RF signal so that the output is straining to match the input dB for dB, and in the case of an amplifier, the DC quiescent point may actually be shifted due to drive level. Please visit our web page on amplifiers to learn more about this topic! Because they are active devices, amplifiers require one or more power supplies. The efficiency of an an amplifier is measured in two ways. Power-added efficiency (PAE) is calculated as the output power minus the input power, divided by the DC power. Drain efficiency is calculated as the output power divided by the DC power ("drain" implies that we are discussing a FET amplifier). Note that the drain efficiency is always higher than the power-added efficiency. However, for amplifiers with high gain (30 dB for example), the PAE is nearly equal to the drain efficiency. Efficiency is a function of many things, including operating voltage, class of operation (A, B, AB, etc), drive level, frequency, temperature, etc. Hey this should say "drain efficiciency! A mixer is used to translate one frequency to another. It is a passive device, meaning that no DC power is applied. It is also a nonlinear device, meaning that for small signals it will exhibit constant conversion loss (much like an amplifier exhibits constant gain) , but at large signals the response will compress and then saturate. In this respect it is similar to an amplifier. A frequency multiplier has a much different power transfer characteristic compared to an amplifier, mixer or limiter. Usually a multiplier follows what is called a "square-law" curve, meaning that the output power is proportional to the input power (in watts) squared. First, one general point about P1dB measurements. If you are working on a receiver, it is customary to specify the P1dB point at the input. For a transmitter or exciter, the output P1dB point is specified. That being said, low noise amplifiers, the most critical component in a receiver chain, most often come with P1dB data measured at their output. If you are the receiver guy, you will need to calculate the worst-case P1dB at the input using the range of available gain that the part may provide.